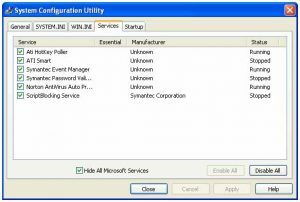 If you’re here, then you want to know how to change windows startup programs which can be pretty pesky at times. If you’re curious as to what you have running, many of the programs have cutesie little icons in the system tray (bottom right side of the screen). The others can be seen by holding CTRL+ALT+DEL. In Windows 98/ME you will see them immediately. Windows XP is ever so slightly trickier. After doing the key combo, you will need to click the Processes tab. “So”, you wonder to yourself, “What needs to be running, and what should be closed?” The way I usually determine what a process is, if I can’t tell offhand, is to do some searching through Google and educated guesswork is in order. Since you are modifying your startup, it is generally a good idea to close down everything that doesn’t need to be running. (I go into slightly more detail here about why) In Windows 98/ME pretty much anything other than Explorer and Systray can be closed. For Windows XP, refer here as to what you should leave running. You’ll notice that I have some items removed at the bottom, and have just removed “qttask” from the boot process. The easiest way to tell if a program is something you want running is to look at the path. “AcBtnMgr_X84-X85″ looks confusing; however, if you look at where it loads from: “E:Progra~1LEXMAR~1AcBtnMgr_X84-X85.exe” then it’s pretty obvious that it has something to do with my LexMark printer. From this we can infer that the BtnMgr part of the filename probably means “button manager”. (I have a scanner/printer combo) The same goes for the rest of it. “WCESCOMM” is in the ActiveSync directory, and thus it’s a pretty good bet that it relates to my Dell Axim Pocket PC. Remove anything you don’t recognize, especially if the path is Windows, WindowsSystem32, or WindowsSystem. Many viruses and spyware apps store themselves in that directory to make themselves look important and to make sure they are in the systems PATH. (I’ll explain what the PATH is in a different article) Don’t worry, anything that you remove using msconfig can easily be replaced if it turns out that you do, in fact, need it. All you do is run it again and put the pretty little check mark back next to it’s name. If you’re a Windows 98/ME user, you can stop reading here. If you are in XP then you’re not quite done yet. 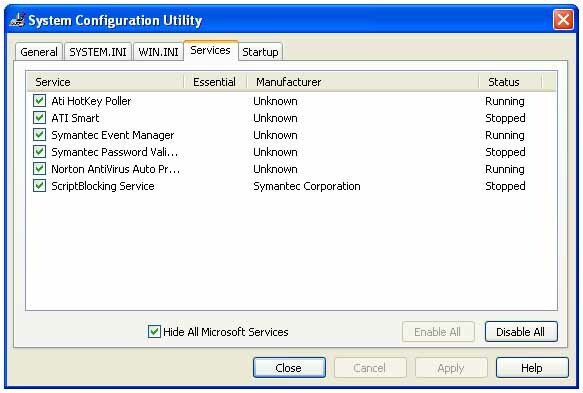 Windows XP has startup items called services as well. 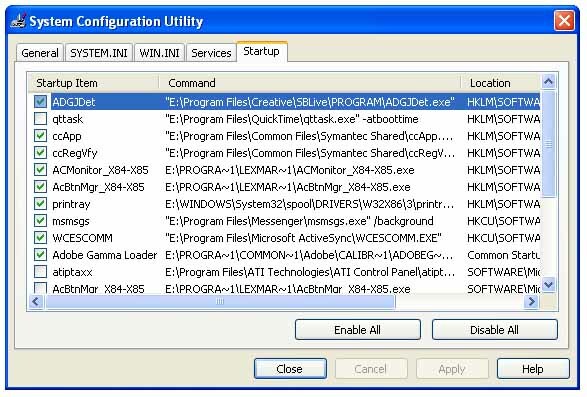 These are usually different components of Windows or add-ons from 3rd party vendors. If you don’t need them running, they slow your system as well and use up memory that would be better spent playing Doom III. There are a lot of services, and I generally don’t mess with the ones from Microsoft, so check the box next to “Hide All Microsoft Services” to make the list easier to read. Review the stuff shown there and make a judgment as to whether or not you think it needs to run. Once again, you can always put it back if needs be. When you reboot the first time a message box will appear telling you that you’ve used the System Configuration Utility to make changes to the way Windows starts. Well, duh. I’m betting we already knew that. Just check the box that tells it not to show itself again, and click OK.
That’s pretty much it! There are other places that Windows looks when it loads, but this covers 90% of it. We’ll get into BHO’s, and registry editing later.